Buttering toast can be a real nightmare. If the butter is too cold it won't spread properly and, next thing you know, your piece of toast is broken. Avoid this breakfast disaster with the Toastie Knife, a heated butter knife that ensures every slice of toast is perfectly buttered. 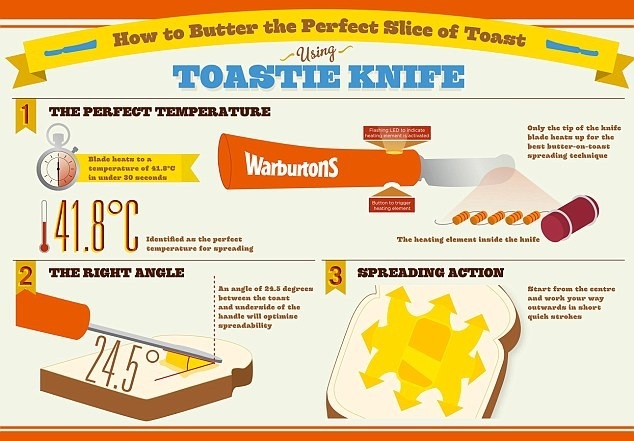 Developed by Bristish bakey Warburton, the battery-powered Toastie Knife heats up to 41.8 degrees Celsius - the optimal temperature for butter spreading, as identified by the country's 'top toast experts' (as the bakery calls them). With just a touch of a button, the Toastie Knife is ready for action.